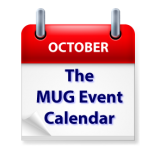 This week’s MUG Event Calendar features three prominent presentations on macOS Sierra and iOS 10 by three different, noteworthy individuals. Apple Senior Systems Engineer Dave Marra will address the topics in New Jersey, The Mac Observer’s Jeff Gamet tackle them in Colorado, and TidBITS and Take Control’s Adam Engst cover them in New York. Other topics on the agenda for the week include podcasting, power tools, favorite iOS apps, iCloud, iMovie and more. Portland Macintosh Users Group – What is iCloud and what does it do for me? Cowtown Mac Users Group – "Show and Tell Your Favorite iApp"
Apple CIDER – macOS Sierra and Siri w/Tidbits and Take Control eBooks publisher Adam Engst. MacGroup-Detroit – Control your house from your iDevice!